Here are some prototype examples of visualizaton tools directed at performance analysis exploration rather than simple reporting. The detailed attributes are discussed below. Additional ackground concerning the general approach can be found in the CMG 2007 conference paper Seeing It All at Once with Barry (PDF). At 12:36:46, the workload begins to ramp up starting at the lower left corner of the triangle; maximum idleness. 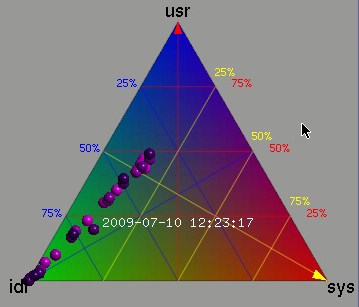 Most of the CPUs (shown as colored dots) gradually make their way up the blue idle axis (decreasing idleness) to cluster around the region bounded by the 25% idle line, the 25% sys line and the 50% usr line. However, 3 CPUs peel off at around 10% usr time and rapidly migrate (rightward) to the 80-90% sys location; near the tip of the yellow arrow. A limitation of the above Mathematica prototypes is that you need to use Mathematica. CPUplayer shown in Fig. 2 above is a stand-alone version of Barry2D, written by Stefan Parvu, that provides animation for visually exploring performance issues based on multiprocessor utilization data. Moreover, since it is an open-source project, CPUplayer can be compiled from publicly available source code. The Apdex Alliance is a group of companies collaborating to promote an application performance metric called Apdex. Apdex is a numerical measure of user satisfaction with the performance of enterprise applications, and reflects the effectiveness of IT investments in contributing to business objectives. The visualization in Fig. 3 above shows both the Apdex index and its component categories can be displayed for multiple geographical locations simultaneously. The Apdex response time measurements were collected from 5 different geographic locations (shown in the legend) over a period of 30 days. Data supplied with permission by Peter Sevcik of the Apdex Alliance. The gray background is superimposed to better display the colored dots. This visualization concept was presented (PDF) at the 2007 Apdex Symposium. Fig. 4 above is a representation of the 3-simplex depecting 4 network performance metrics in three dimensions for 1,000 network segments depicted as a cloud of points. It is very clear, even without looking closely at the visual area, that the points cluster into 3 sub-clouds along certain viewing angles. This is the barycentric analog of the MacSpin example. One way to maintain all input digits explicitly is to represent them as a string of characters. This can be accomplished by either reading the number in from the keyboard or by passing it as a string-valued parameter in quotes. Otherwise, an input number like 0.040300 (which has 5 sig digits) would be represented as 0.0403 in numerical form (trainling zeros are truncated) and that would lead to the incorrect conclusion that the number only had 3 sig digits on input. For more background information see Chap. 3 of Guerrilla Capacity Planning and Significant Figures in R and Info Zeros. Compute the significant digits in a number. The input number is correctly rounded to the required reporting significance using the new rounding rule that avoids parity bias. See also Significant Figures in R and Rounding. Join the ongoing discussions at the PerfViz Google group. Copyright © 2002-2011 Performance Dynamics. All Rights Reserved. On 27 Mar 2014, 17:59.